Pottery is a continuous curiosity: how it’s made, how it feels, its shape, its surface, how it exists in a home as an object, or a tool, or maybe an image. When making pottery, I search for poised forms that suggest sculpture, respect utility, and perform well; they should be confident and handsome. Slip warms up during the firing, the surface dampens, and layering is revealed. The relationship between form, firing, and my hand is complete. Each piece is ready for a conversation and willing to be part of a greater surrounding. Matt Kelleher has recently joined the ceramic faculty at Alfred University after a decade of being a studio potter in the mountains of western North Carolina. 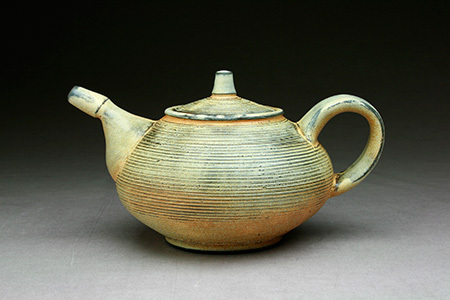 Matt has participated in residencies at Penland School of Crafts, Archie Bray Foundation, and Shigaraki Ceramic Cultural Park in Shigaraki, Japan. As Matt continues to investigate soda-fired tableware, his studio practice now includes larger sculptural ideas.